On a recent post on Amish architecture, I shared some sure-fire ways of picking out Amish homes from the non-Amish. Some of those ways have become less sure-fire as Amish homes have come to resemble English ones. 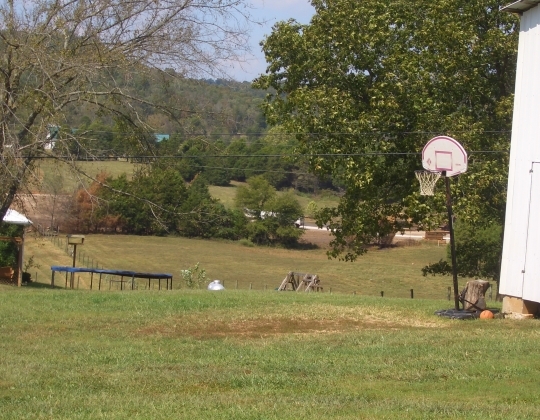 I suppose we could also add the barnyard basketball hoop as another sign. I have shot around on these grass courts before. I’ve never really figured out how you are supposed to dribble on one. In any case, I think this court is in a lot better shape, than, say this one. Boy, I used to love jumping on trampolines. And, let’s be honest, still do. As boys, my brother and I never had one. Maybe Mom thought they were too dangerous. But our cousins did, and we always looked forward to visiting them. No one ever got hurt. 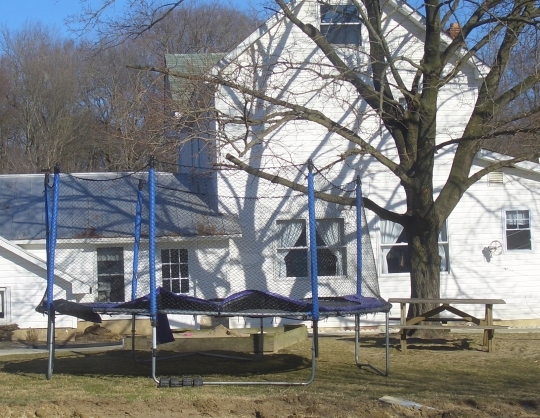 My last time on a trampoline was about 2 years ago, in Lancaster County, at an Amish friend’s home. The kids wanted me to join them (they didn’t have to twist my arm). What fun it was. But my luck finally caught up with me. Nothing dramatic like a broken leg. But after hopping down I discovered a part of my back I didn’t know existed. I guess I threw something out. I’m really averse to wearing any kind of medical implements. But since I needed to be able to walk, I had no choice but to wear a back brace for a few days. It was that bad. I suppose I learned why we don’t see too many adults on these things. As fun as they may be. But will that keep me off the next time? Erik, not all your photos loaded. Thanks Magdalena, should be all set now. I keep wanting to write “Magda” when I respond to you b/c that is the very common short form of your name in Poland. Must read : secret government Trampoline being built ! Beth looks like you still turned out alright even without one 🙂 Sounds like a lovely trip to Daviess Co. On Amish homes in that community, I remember they have a pretty hot summer. I actually think of them as “southern Amish” even though it’s Indiana. If you spoke with them you know what I mean. When I was selling books there, quite a few families were set up in the basement for the summer. They at least were doing cooking and eating and hanging out down there in the cool. Can’t blame ’em. That’s SO funny that you said that about their speech because I said the SAME thing when I was there. I said, “How come we just had to drive straight across IL to get here and yet I feel like I’m in Alabama?” They were very friendly though. We went in a shop that makes buggies and my husband asked the man if there’s anything he won’t put on a buggy because of church rules or anything and the man said, “If they pay me, I put what they want on there,” which I thought was funny. Of course he didn’t just make them for his district. Well, I do see that the Amish seem to becoming more “English.” I am currently in Northeastern Ohio/Northwestern Pa., and have seen alot of things that surprise me, like Amish walking around with cell phones. Actually, I saw some teen agers carrying a cell phone, so I guess they’re on their rumpspringa. Over this past weekend, I attended a Pymatuning festival, and saw young Amish girls with digital cameras and those glow-necklaces around their necks. Sigh! When our kids were young, we had a friend use his backhoe to dig a deep hole in our backyard and put our tramp over it. We had the kind where the material stretched out and was held at the corners with huge springs. They always jumped high and with nothing to fall off, we felt it was pretty safe. We also had a tramp for a group home we ran, and we found it to be a great stress reliever for the kids. Never a serious incident, except a few arguments about whose turn it was. Sounds like a brilliant simple idea. Never occurred to me. In 2009, I traveled to Poland. One of the reasons I went was to visit a friend named Agnieszka. Her best friend was Magda. I soon learned that almost all young ladies in Poland are named Agnieszka, except for the ones named Magda. In the Cloth Hall in Krakow, I saw a t-shirt in English that listed the top ten reasons to visit Poland. “Agnieszka” and “Magda” were both on the list. James, that’s about right. “Ania”, “Asia”, and “Ola” were probably on that list too. Certain name are just very popular. I know a polish lady named Agata. Maria seems to be common, but there is a faith based reason for that. I use to have a job where I got paid to jump on a trampoline. When I was in high school I worked in a western wear store and for some reason the owner decided to handle trampolines. If things got slow he would let us go out front and jump on the tramp; said it was good advertising. He and his wife lived upstairs in an apartment over the store. One night he went out and got drunk, so she wouldn’t him in the apartment. He knew that the window in the front room was unlocked so that drunken fool got on the trampoline and jumped & jumped pushing on the window sash until he got it raised. Then he tried to jump INTO the apartment THROUGH this second story window. Believe it or not, he actually made it into the apartment … at least he did from the waist up. Unfortunately his feet crashed into the gigantic plate glass window of the western wear store and since he was wearing cowboy boots at the time (don’t ask) he broke out the plate glass window. His wife was so mad that the next day when I got to work the trampolines were all gone. That ended my trampoline jumping days.